Ten Speed Press, 9781607741688, 208pp. Land Killer Internships—and Make the Most of Them! These days, a college resume without internship experience is considered “naked.” Indeed, statistics show that internship experience leads to more job offers with higher salaries—and in this tough economy, college grads need all the help they can get. 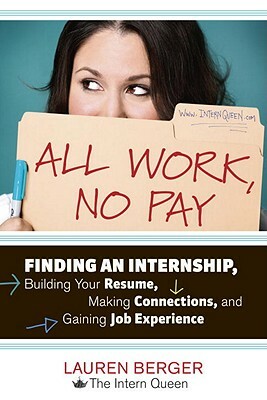 Lauren Berger is CEO of Intern Queen, Inc. (internqueen.com), an online internship destination and listing service that she founded after completing fifteen internships for the likes of MTV, FOX, and NBC during her college years. She was named one of BusinessWeek’s “America’s Best Young Entrepreneurs 25 and Under,” has been featured in the Wall Street Journal, New York Times, and Washington Post, and has appeared on CBS Sunday Morning, ABC News Now, and more. She speaks at campuses and professional groups across the country and lives in Toluca Lake, California.